Click Here for a YouTube Video . . .
Scalable up to 200,000 Sq. Ft.
Cel-Fi Quatra is an active DAS hybrid. A single system can be installed with a donor antenna and be configured to provide coverage up to 50,000 sq. ft. 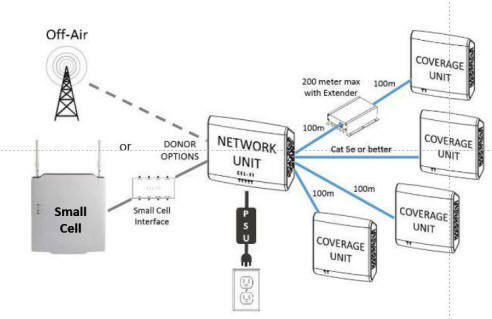 It is comprised of one Network Unit (NU), which is the hub of the system; and one to four Coverage Units (CU), which are the remote radio units of the system that rebroadcast the donor signal. Cel-Fi Quatra can also be deployed within larger venues using a small cell donor signal, combining up to four Quatra systems. 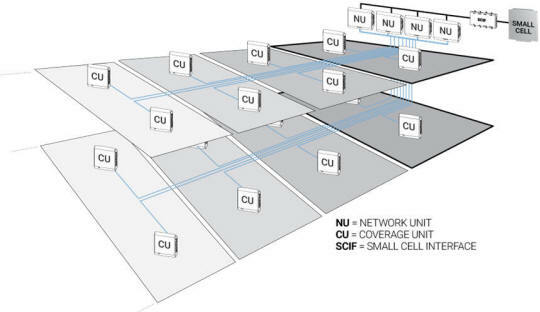 In this scenario, by synchronizing the outputs from multiple CUs, the coverage area of each Coverage Unit is stitched together to form one large cell (a "Super-Cell") that can provide coverage across an entire building of up to 200,000 sq. ft. The simplicity of a Cel-Fi QUATRA installation and commissioning can be installed faster than other available solutions. standard Cat 5e (or better) cable is used to connect the Network Unit (NU) with each Coverage Unit (CU). When powered-on, all network and system optimizations are performed automatically. Cel-Fi Quatra can also be deployed within larger venues using a small cell donor signal, combining up to four Quatra systems. 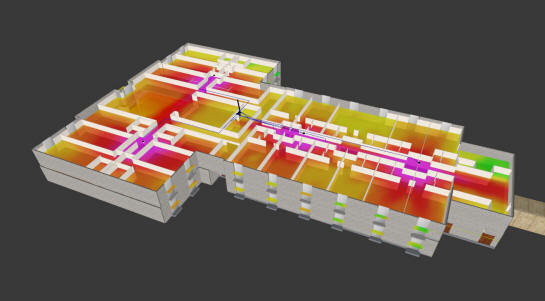 In this scenario, by synchronizing the outputs from multiple CUs, the coverage area of each Coverage Unit is stitched together to form one large cell (a "Super Cell") that can provide coverage across an entire building of up to 200,000 sq. ft. The simplicity of a Cel-Fi QUATRA installation and commissioning can be installed faster than other available solutions. standard Cat 5e (or better) cable is used to connect the Network Unit (NU) with each Coverage Unit (CU). When powered-on, all network and system optimizations are performed automatically. A large enterprise may be able to support the costs of a traditional DAS solution that requires extensive planning, RF design, engineering, and highly skilled technical installation and maintenance, as well as extensive budget and contract negotiations with multiple vendors, integrators, and the carriers themselves. But the cost of a traditional DAS solution typically puts them out of range of the small to medium business. Venues that range in size from 10,000 to 200,000 sq. ft. are particularly challenged with the price/performance gap, as they are too large for affordable consumer-grade solutions and too small for high-performance DAS. Cel-Fi Quatra was designed to standardize on dedicated Cat 5e cabling to simplify the installation process. Better cable can be used, but is not required. As the Control Units are powered antennas, they have full transmit power available. There is no coaxial distribution power loss. The Coverage Unit is powered over PoE. The Network Unit and the Coverage Unit may be separated by as much as 200 meters when the optional Quatra Range Extender (QRE) is placed inline. The QRE is plug and play, and doesn’t require independent power as it also is a POE device. Cel-Fi Quatra also includes support for MIMO, and up to 75 MHz of combined channel bandwidth across four (4) independent cellular bands. This provides flexibility for supporting mixed 3G and 4G networks. All of this translates into a lower cost of coverage per sq. ft., and faster, hassle-free deployment times. Multiple Cel-Fi QUATRA systems may be installed and will self-organize to support larger spaces. We use iBwave as the basis of our Computer Aided Design and Keysight Nemo Walker Air for our site surveys and for design verification.